Thank you for your interest in membership in the Brittany Club. There is currently a waitlist from both core and non-core neighborhoods. Below is information on the membership application and approval process as well as Frequently Asked Questions. 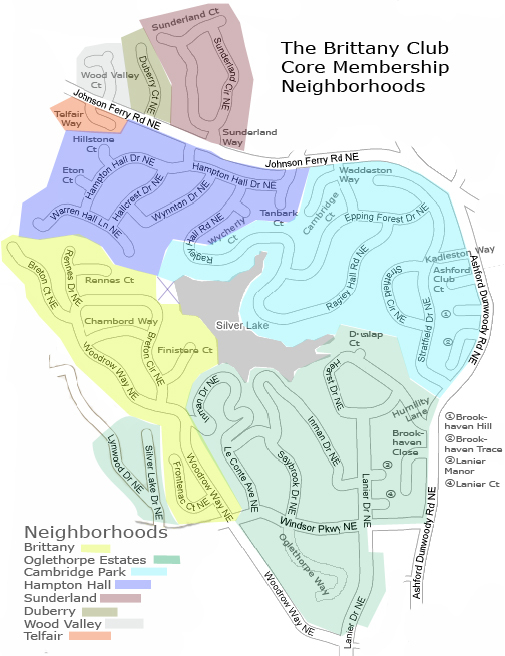 Refer to the Core Neighborhood Map for the addresses considered core. If there are any questions whether a property is core, please contact the membership chair. No other interpretations will be accepted including those presented by realtors, tax records, or others. Non-core are all areas not in the core neighborhood map. Memberships from these areas are limited to twenty five (25) percent of the maximum number of certificate holders (as set forth in Article VIII, Section 1 of these bylaws). All non-core applicants must pay a $100 non-refundable and non-transferable application fee. Any non-core application not accompanied by a check will not be considered. You MUST include your email address for this is used for all correspondence. Failure to include email address may lead to rejection of application. In the event of an opening in the Club Membership, applicants from the core subdivisions take precedence over all others. Applicants will be considered in the order the applications were received based on postmark; the oldest postmark will be the first application for consideration. In the event of an opening, and there is no current applicant from one of the core neighborhoods, applicants from the adjacent neighborhoods will be considered in the order the applications were received based on postmark; the oldest postmark shall be the first application for consideration. If all authorized memberships are taken when an application is received by the Membership Chair, then the applicant will be placed on the waiting list by category. Membership will be offered to an applicant after a completed application has been considered and approved by a majority of any quorum of the Board of Directors. Applicants who have been approved will have two weeks from the first date of mailing of written notification (invitation) of approval to pay the initial assessment (initiation fee plus membership fee) set by Board of Directors. Currently, there is a wait list of families that would like to join Brittany. The wait list has a core component and a non-core component. Because Brittany is a neighborhood club, applications from the core area are given preference over non-core. Applications are first prioritized by "core" or "non-core" status and, within those categories, then listed based on the postmark date on the envelope, regardless of what date is on the application. When a spot becomes available, the Board will extend invitations to the first families on the core wait list. If any of those families decline or defer, we will move to the next family on the core wait list. Once we have gone through the families on the core list, we would look to families on the non-core wait list until the club reaches its total membership capacity. We haven't been able to extend an invitation to a non-core family in close to 10 years, and as such the nob-core waitlist is extremely long. We typically discourage people from submitting non-core applications since there is a $100 fee and it's unlikely non-core invitations will be extended. At this time, there is not a mechanism for moving higher on the list through donations, volunteerism, etc. When are invitations generally extended? In terms of timing, invitations are generally extended at the beginning of the calendar year (after annual dues are collected). We have, in prior years, extended invitations mid-year in the case of a current member resigning his or her membership mid-year (this just depends on the time of year and whether the member notifies us). How many Members are accepted each year? The Brittany Club has a capped number of members set at 310 regular memberships. New members are extended offers of membership as existing members resign. For this reason we are unable to estimate the number of available memberships each year. Can a non-member join the Brittany Club Swim Team? Per the Club bylaws, swim team members must be a member of the Brittany Club. The current Dues and Fees listed below are subject to change between the time you apply and the time you are accepted as a member. Effective 01/01/2017. * After July 15th dues dues are invoiced at 50% of annual rate and after Sept 15th no dues are invoiced. Annual dues notices are mailed in October, due in November, and past due December 1st. For example: If you join in May, dues for the next year will be payable again in November. Any member who resigns or is terminated under any of the provisions of these bylaws and subsequently reapplies for membership, upon approval of the re-application, will be required to pay all fees and dues as outlined without regard to any fees or dues paid in the past. The initiation fee will be set by the Board of Directors, and they may raise or lower the amount as they deem appropriate to the needs of the Club. If a waiting list applicant declines the invitation to join but wishes to have the application reconsidered at a later date, then the applicant must timely notify the Board of Directors by mail and the postmark date on that notification will be taken as the date of the application. For complete information on the membership rules and provisions please consult the Club's Bylaws.